Always wanted to learn to sew? Come along to this fun class and make your own Tote Bag and Apron while learning the basics of sewing. 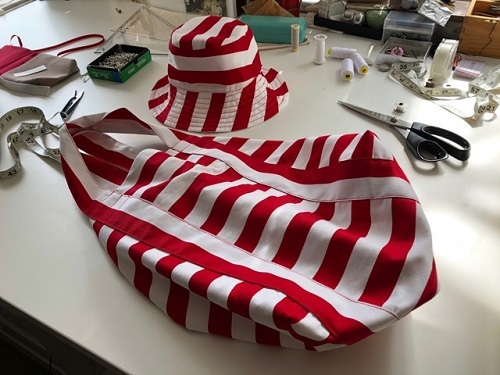 This course is designed for those new to sewing and will teach fundamental sewing skills while making a tote bag and an apron. At the conclusion of the course you will be confident at the machine, and will have completed two practical garments. You will learn lots of helpful tips along the way about design, fabric, and construction techniques. If there is time, we will make a bucket hat. The tote and apron patterns will be supplied, but you will need to bring pins, fabric, thread, interfacing, etc. Full details will be provided on Week 1 so bring a pad and paper to class. On the first night you will be learning basic skills and becoming familiar with the sewing machines and overlocker. Karen will discuss suitable fabrics and interfacing options with you, how much you will need, and the best places to shop. Our sewing room is equipped with domestic Bernina sewing machines which are available for you to use during class. You may prefer to bring your own machine to get familiar with its operation. For further information, please call the office on 5219623. There are scissors (fabric and paper), measuring tapes etc in the sewing room to use during class, but we recommend that you bring your own kit as follows. We will discuss your sewing kit on the first week, and the best places to shop for various items. This course Sewing for Beginners will give you the necessary skills and knowledge to attend our Sewing - Next Steps course where you have the option to make an A-line or a Pencil Skirt.